There have been some changes to the upcoming Florida trip, but the trip is still on (and coming up). We went down a man when Jason Pirus had to pull out, but we were back to full strength when we added Adrienne Comeau. 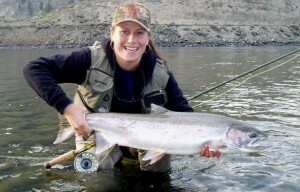 Adrienne works for IF4 and Fly Fusion Magazine, not to mention she’s a steelhead guide so she’s got some cred. We decided to go with diversity. Yup. That’s right. She’s Canadian. She’s been to the salt before and is pumped about the trip. Speaking of the trip. One of the guys we’ll be fishing with is Eric Estrada. Eric is an artist and pretty damn good at his craft. He does some solid work and he obviously has a sense of “place” firmly rooted in Florida. I’m very much looking forward to hearing him talk about his Florida in person. 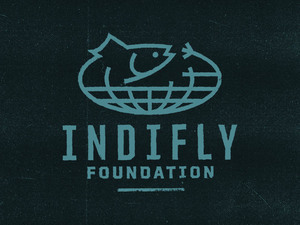 Eric is part of the Skinny Water Culture crew and contributes to their blog, which is just full of awesome. Florida… very much looking forward to this. This entry was posted on Tuesday, April 23rd, 2013 at 2:18 am	and is filed under Locations. You can follow any comments to this entry through the RSS 2.0 feed. You can leave a comment, or trackback from your own site. Absolutely Gavin… I believe it to be true. Eric is a great guy who’s helped us out at CCA before. 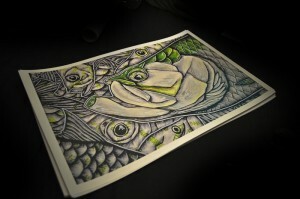 I had his redfish piece but gave it away to a friend. What are your Florida destinations? We will be mostly in the upper Keys I think.